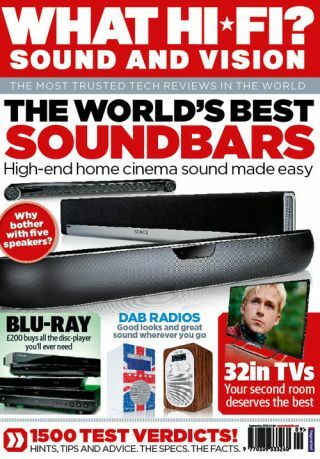 September issue on sale now, in print and online | What Hi-Fi? Our September 2013 issue is available now online, on your tablet and in the shops. However you choose to read it, it's packed with some of the hottest new kit money can buy. For starters, we realise not everyone wants lots of speakers and cables cluttering up there living room, so a soundbar is a neat and simple way to boost the sound of your flatscreen TV. This month we've rounded up five luxury models and put them to the test. If you're looking for a smaller screen telly, perhaps for your bedroom or study, this month's Supertest is a roundup of the latest 32in TVs from all the big-name players. With prices starting from just £280 they don't cost the earth, and many of them have the smart TV capability offered by their bigger brothers. Of course there's more to you home entertainment that just regular TV, and if you want the best film experience then there's no better way to get it than by investing in a Blu-ray player. Now we know you can pick up a budget supermarket Blu-ray player for around £50 these days, so why pay more? Well, the answer is better sound, better pictures and extra smart functionality. To prove the point, we've rounded up a quartet of £200 models and put them through their paces. Elsewhere in the issue you'll find a roundup of portable DAB radios so you can listen to your favourite music while out in the park, in the garden or on the beach. Prices start from just £50. And for those of you with a computer full of music, what better way to unleash your tunes than with a top-notch pair of desktop speakers. We've tested the latest models from Bose, Epoz, Monitor Audio and Ruark Audio, with a surprising result. As for First Tests, as ever we have an array of exclusive reviews including Naim's UnitiQute2 music streamer, Cambridge Audio's old-school SX-60 standmount speakers, Sennheiser's superb IE 800 in-ear headphones, an SACD player from Pioneer with a modern twist and KEF's mighty X300A active stereo speakers. All this and more is in the September issue of the magazine, on sale now.